eD@HoMe: My first cover from Luxembourg! 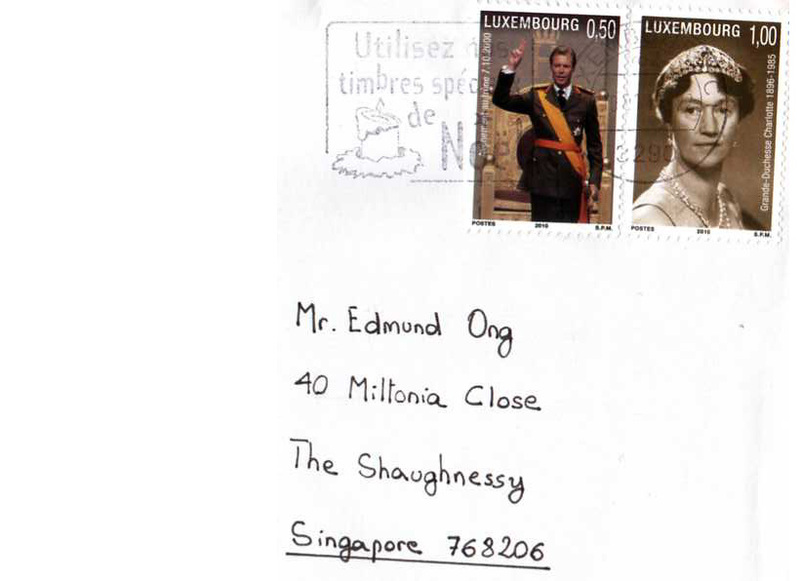 Many great thanks to Arturo Sparapano for offering my first cover from Luxembourg! 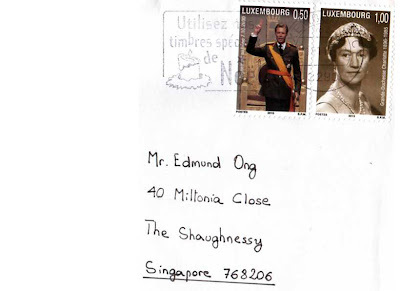 The stamp on the right shows Grand Duchess Charlotte (1896-1985) and the second one features the present Grand Duke Henry. Today Luxembourg is the only remaining grand duchy. It has been a grand duchy since 1815 when the Netherlands became an independent kingdom and Luxembourg was handed over to the King of the Netherlands, William I. Luxembourg remained in personal union with the Netherlands crown until 1890 when William III, King of the Netherlands and Grand Duke of Luxembourg, died without leaving a male heir, so that in the Netherlands he was succeeded by his daughter Wilhelmina and, in the Luxembourgish Grand Duchy, by a distant male cousin, Duke Adolf of Nassau who became HRH Grand Duke Adolphe—an arrangement necessitated by Salic law being applicable to Luxembourg but not to the Netherlands.